This blog post was made by Nieltje Gedney on December 15th, 2016. I am angry. I am angry at myself for taking the path of least resistance and allowing myself to be a victim of sub-optimal dialysis treatment for the past year. I succumbed to the fear of reprisal by my health care team instead of demanding the health care that I needed and deserved. A well-substantiated fear, I might add. I am also angry on behalf of those dialyzors who don’t know any better; who don’t even realize they are receiving sub-optimal care, and who just blindly accept the status quo as a condition of their existence on dialysis. I would not be so angry if I didn’t know how good dialysis could actually be. How do I know? Because I have met the doctors, nurses, techs, and seen the clinics and other team members that actually strive to provide the best in dialysis care. They treat the entire patient, not just lab values, and respect quality of life issues and decisions. They understand that dialysis is a lifelong journey and commitment that must be shared alike, patient and care team. They know what patient centered care is and apply it daily in their practice. I know this exists because I have been on the receiving end of good dialysis, and felt the difference in my quality of life. But dialysis is not static, and as you and the treatment evolve over time, changes are required. This is where drive-through dialysis lets us down. Good dialysis is a premium product, and hard to find. The standard of care is your basic drive-through order, quick and often delivered cold. For example, for one entire year, I attended monthly clinic visits in 15 minutes or less. It took longer for me to drive to and from the clinic than it did to actually attend it! From the moment my nurse “welcomed” me to clinic, I would step on the scale, print out an auto-weight and by the time I had entered the treatment room they have a thermometer in my ear and a blood pressure cuff on my arm. Once I have completed the sitting pressure, while getting a standing pressure, my monthly “educational’ topic is shoved under my nose, requiring a signature, which, of course means using my arm with the blood pressure cuff attached. After that, I sign that I maintained my machine, did all my treatments, and receive a bag with lab tubes for next month, a postcard with the next clinic date, and, if it’s a holiday, a bag of candy or some other “treat”. The doctor waltzes in, stands in a corner with the nurse, reviews the labs briefly, just out of my hearing range, and says everything looks good, see you next month, and is gone. Wow, that was informative! That’s it. 15 minutes tops! Seriously, why bother getting out of the car? In future years, I can imagine, with the increase in the use of telemedicine, I could be hooked up, in the comfort of my home, to a robot that completed all of the above functions, and automatically transmitted the results to my computerized chart. At least I wouldn’t be inconvenienced by a 45 minute drive each way! And I suspect that a relationship with a robot may be more rewarding than the drive thru dialysis that I currently go out of my way to receive. The US is the only country that offers drive-through, fast food options. In most of Europe and ANZ, drive-through eating just doesn’t exist. Nor does drive-through dialysis. People abroad believe that if you are going to eat or drink, then you stop what you are doing, grab a seat in a café, rest stop, or coffee shop and enjoy the break with conversation, even comradery. They would no more think of driving down the road eating a Big Mac and drinking a coffee than they would accept an impersonal 5-10 minute clinic visit for dialysis. So why do we put up with it. Why did I put up with it for almost a year? It wasn’t for lack of trying. I have been concerned about certain lab values for months, even did the research, and tried on several occasions to discuss a proactive approach to anemia management. The reply was “we are following protocol”, “we are not interested in your studies”, “too much iron can damage your liver.” I shut down, and stopped trying to communicate with my “team”. After one year, I lost all the ground I had gained during the previous two years of optimal dialysis. I was, in my opinion, severely anemic, and the occasional 100 units of venofer that I was sparingly allowed, out of “concern” for my welfare, and according to some protocol I have yet been able to fathom, did not help. Consequently, my anemic symptoms resulted in irregular heartbeats, problems breathing, skin bruising, open sores in my mouth, lips and hands and more. But my liver is fine, I am pleased to announce. Not one of my team asked, nor cared that my quality of life had deteriorated to pre-dialysis levels. Yes, I am angry. I am a real person, not some algorithm; someone whose needs may not necessarily respond to your “protocol.”. Not once did they listen to how I felt, or address my concerns, as my hemoglobin plunged. I deserve the same respect that I initially accorded to them when I chose this clinic to manage my care. I deserve to be heard, to be included in decisions involving my care, and if I have research and information that might help in making those decisions, then let’s discuss it. Shame on me for not being able to achieve this, and letting it affect my health for almost a year. Shame on them, my medical team, for allowing my health to deteriorate in the name of some random protocol or algorithm. Dialysis is NOT a one size fits all prescription. Ironically, as I was writing this blog, I read an article in the Washington Post ( "A doctor with a bad knee runs into one-size-fits-all medicine" ), written by a doctor who had knee surgery, and suffered terribly post-surgery. He, like me, did everything he was supposed to do, and his condition continued to worsen, until he finally sought counsel elsewhere. In a 1969 lecture, British psychoanalyst Enid Balint introduced the term “patient-centered medicine,” the idea that “the patient, in fact, has to be understood as a unique human-being.” Almost 50 years later, we are still far from fulfilling that objective, but every aspect of health care needs to strive for it — needs to strive for individualized care. He referred to his care as “one size fits all”, something that dialyzors are, unfortunately, all too used to. 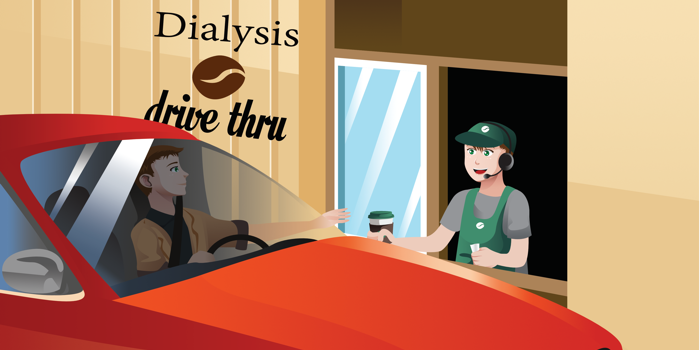 I refuse to eat at a drive thru, so why would I settle for it with my dialysis? Going forward, I for one, will no longer accept one size fits all, and expect, no, demand, that my care be customized to my dialysis needs. I know you don't hear it often or maybe not at all but I am ashamed that some of my counterparts do not put the patient first. You are correct, you are a person 1st. Many times health care providers forget about the patient they are treating. I have switched doctors for the same reason. What some (ARA)clinics are trying to implement is putting a staff member in a chair for 4 hrs so they can feel somewhat what the patient is going through. With PD it's a different issue. Sometimes you have to find a place, visit it, talk to other patients to determine what is best for YOU! Unfortunately some people are not in Healthcare to take care of patients! This sounds like a few facilities I've worked in. This article is sad but true. Sometimes we fail to provide that part of patient care that makes a difference.....Empathy. Everybody is somebodies somebody. I will pray that you receive the care that you deserve. I am a hemp patient and I get dialysis care in the clinic. I am on dialysis due to high blood pressure. I have been on dialysis for 5 years and in that 5 years I have had to manage my own blood pressure and the nursing staff have me an overdose of iron nearly killing me. I am in the middle of litigation as I am writing this. My doctor comes in during my treatment and spends approximately 5 minutes talking to me about lab results. I have tried to talk to him about my blood pressure meds not working but he could care less. I am basically treating myself. Dialysis is a HUGE business. We are treated as money not patients. I really hope things get better for you but unfortunately as patients we have to be proactive in our care. I posted this to the social worker listserv and suggested they share it with their staff in hopes that all will see the importance of providing care that is not just "pretty words" but truly patient-centered. Dialysis staff who don't suffer from it have no idea how much unmanaged anemia can affect their patients' lives. much medication she receives. (I most certainly did not say that, I said that lab values should be considered when dosing). After reading my medical records, I can prove that they are not even following Davita protocol, if indeed they know what it is. Brava!! You deserve to be treated with respect and dignity. Shame on your nurses and doctor. Shame on them for not understanding that you are YOU, not some name on a chart. Yes!! Great post! I will be going back in dialysis soon, and already dread the interactions of which you write. I have phenomenal patient-centered care through my transplant center, and I swear that it's made the single biggest difference in my health. I would sadly still be going into ESRD anywhere else, but my team has walked this road with me arm in am.